The Russian tank battled many teething troubles before making its mark in military history, though it arrived too late for WWI. The First World War was a catalyst for new ideas in military engineering, including armored technology. Russian engineering minds were already grappling with the idea of mobile armor long before the tank made its battlefield debut. The driving force, figuratively and literally, was the modern tank’s fundamental component, the caterpillar track. In 1878, Fyodor Blinov, a Russian peasant from the Samara Region, patented a “wagon with endless rails for transportation of goods by main and back road” that was based on the principle of caterpillar motion. With the outbreak of the First World War came a gamut of armored vehicle projects. The closest to the contemporary tank with caterpillar drive, an armored body and a turret with weapons, was put forward by inventor Alexander Porokhovschikov in 1914. 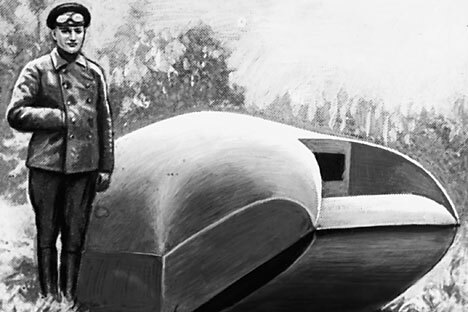 His vezdekhod, or ‘go-anywhere vehicle’, was fitted with 8 mm multi-layer armor consisting of three parts: an external 2 mm-thick cemented steel sheet, and shock-absorbing layer containing hair and algae, and finally a steel inner sheet. A key design feature was the system of combined movement, with wheels for the highway and caterpillars for cross-country use. The vehicle was also watertight. The vezdekhod was equipped with a 20-horsepower engine that gave a road speed of 26.5 km/h, the record for First World War tanks. There were no weapons or armor, however, these being simulated by adding equivalent weight to the prototype. The 3.5-ton vehicle was ready for testing in May 1915. But it quickly ran into problems in caterpillar mode when the tracks came free from their guide blocks. A further problem was that the vehicle would not move at all on loose snow. Final adjustments were made in 1916, but the design was abandoned, as funding dried up. Meanwhile, Lieutenant Nikolai Lebedenko was also working at the elusive breakthrough tank design. In early 1915, the army engineer created a machine that could feasibly breach barbed wire and enemy trenches. The ‘Tsar Tank’ was named after Lebedenko’s unswerving belief that these machines could “break the entire German front in one night, and Russia will win the war,” as he told the emperor at a personal audience. A special design feature was the chassis consisting of two large driving wheels and a rotating rail trolley. Overall, the design resembled an oversized artillery gun carriage, driven by two 240-horsepower Maybach engines. Construction of the prototype was completed in 1917, and it was immediately clear that the vehicle was underpowered when it got stuck fast in the first ditch during trials. But while unsuccessful, the Tsar Tank project saw the involvement of such future stars of Soviet engineering science as Zhukovsky, Stechkin and Mikulin. Another 1915 prototype also came from the Rybinsk plant, which mainly reproduced French designs. Crewed by four men and weighing 20 tons, the tank’s 200-horsepower engine allowed sufficient maneuverability despite its heavy cloak of 10-12mm armor. The tank carried a rear-firing 107-mm gun inside the housing, while a heavy-machine gun was placed in the front beside the driver. But despite its practical design features, the design did not impress the country’s military-technical chiefs and received no support. Another contender was the concurrent project by Vasily Mendeleev, son of the famous chemist and inventor Dmitry Mendeleev, which was presented to the Ministry of War in August 1916. Developed since 1911 on Mendeleev’s personal initiative, the tank was equipped with anti-shell armor and other technical innovations that would find application in later years. Mendeleev proposed pneumatic suspension units for the chassis, while the vehicle was steered with a servo motor. Since the main gun was a 120 mm cannon, he wanted to build a body that could be lowered during firing in order to reduce the load on the chassis and also protect the caterpillars from enemy fire. The tank was supposed to be transported on railway platforms, thereby increasing mobility and ensuring swift delivery to the front. But the cost of the various innovations was its 170-ton weight, as well as the production demands for such an ‘armored vehicle’, as Mendeleev himself called it. This all deterred the ministry from pursuing the design. Ultimately, Russian tanks did not fight on the battlefields of the First World War. Despite the best efforts of engineers to equip the army with modern weapons, these attempts mostly failed to get beyond the test phase. Nevertheless, many of the proposed ideas found later application, with many becoming embodied in the tank battlefield’s combatants of the future.